Overall, 4713 clinical trials that were registered on CTRI from 2012 to June 21, 2016 (2016, n= 554; 2015, n= 1130; 2014, n= 1077; 2013, n= 992; and 2012, n= 960). Of these, 507 (10.8%) clinical trials were Ayurvedic studies. The registration of Ayurvedic clinical trials increased from 9.3% (2012) to 19.9% (2016), however in 2013 and 2014 these numbers were slightly lower (7.0% and 8.2%, respectively) [Table 1]. 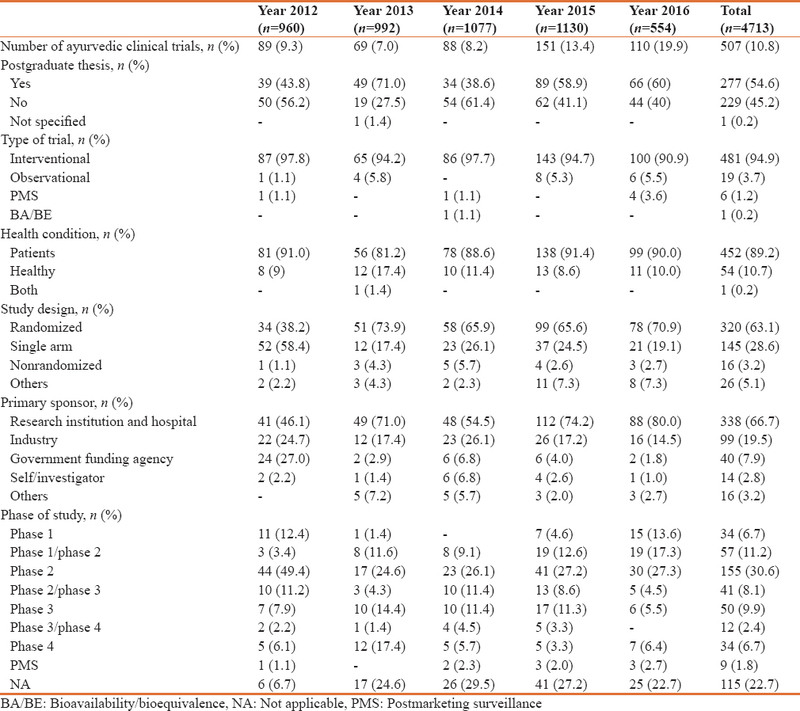 Overall, 54.6% of studies were postgraduate thesis, 94.9% of studies were interventional, 89.2% of studies involved patients, 63.1% were randomized studies and 28.6% were single arm studies. Majority of studies were sponsored by research institutions and hospitals (66.7%) followed by industry (19.5%), and government agencies (7.9%). Phase II studies were highest (30.6%), however, for 22.7% of clinical trials, phase was stated as 'not applicable' [Table 1]. Overall, 73.6% of studies were registered retrospectively and 26.4% registered prospectively. The prospective registration of Ayurvedic clinical trials increased from 6.7% in 2012 to 44.5% in 2016 with slight decrease in 2015 [Figure 1]. Of the studies that were postgraduate theses, 79.1% were registered retrospectively and the rest (20.9%) registered prospectively. 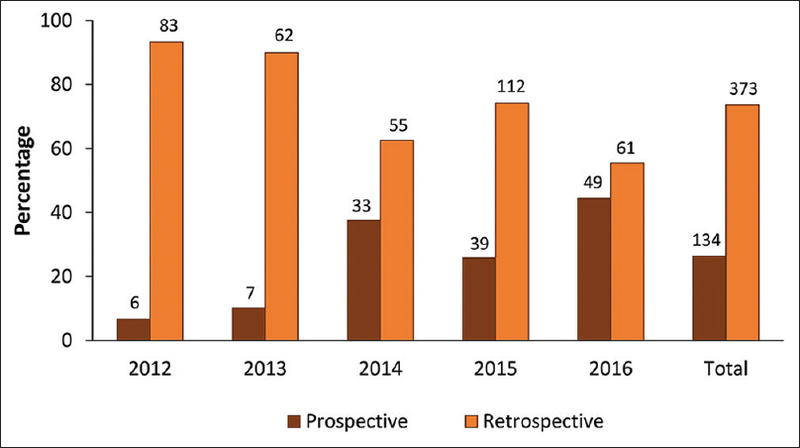 Highest number of prospectively registered postgraduate theses were registered in 2016 (48.5%) and lowest in 2012 (2.6%) [Figure 2]a. [Figure 3] shows the first participant enrolment in the trial from the date of registration. Among retrospectively registered studies, 16 studies enrolled their first participant more than 5 years before the registration of trial (2012, n= 4; 2013, n= 2; 2014, n= 2; 2015, n= 7; and 2016, n= 1), 29 studies enrolled their first participant between 2 to 5 years before the registration (2012, n= 4; 2013, n= 3; 2014, n= 4; 2015, n= 11; and 2016, n= 7), 100 studies enrolled their first participant between 1 to 2 years before the registration (2012, n= 22; 2013, n= 14; 2014, n= 15; 2015, n= 29; and 2016, n= 20), and 225 studies enrolled their first participant within years before the registration of trial (2012, n= 52; 2013, n= 42; 2014, n= 34; 2015, n= 65; and 2016, n= 32). There were 21 studies that enrolled their first participant before 2010. 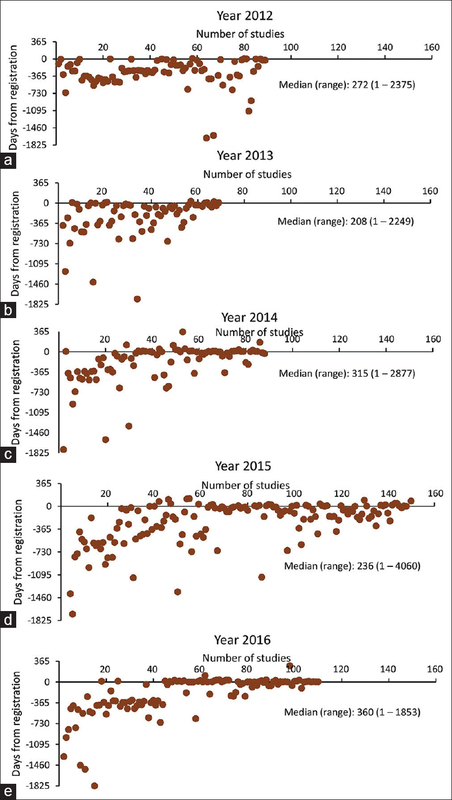 The median (range) time to first participant enrolment in the trial from the date of registration was increased from 272 days (2012) to 360 days (2016). Overall, these 507 studies had 686 study sites, of which the highest number were located in Gujarat (38.3%), followed by Maharashtra (19.2%). The proportion of studies registered in Gujarat increased from 20.5% (2012) to 57.7% (2016) [Table 2]. International Clinical Trials Registry Platform (ICTRP). Available from: http://www.who.int/ictrp/trial_reg/en/. [Last accessed on 2017 Feb 15]. Abaid LN, Grimes DA, Schulz KF. Reducing publication bias through trial registration. Obstet Gynecol 2007;109:1434-7. Pandey A, Aggarwal A, Seth S, Maulik M, Bano R, Juneja A, et al. Clinical trials registry – India: Redefining the conduct of clinical trials. Indian J Cancer 2008;45:79-82. Clinical Trials Registry- India. Available from: http://www.ctri.nic.in/Clinicaltrials/cont1.php. [Last accessed on 2017 Oct 31]. World Medical Association. World medical association declaration of Helsinki: Ethical principles for medical research involving human subjects. JAMA 2013;310:2191-4.
International Committee of Medical Journal Editors. Recommendations for the Conduct, Reporting, Editing, and Publication of Scholarly Work in Medical Journals. Available from: http://www.icmje.org. [Last accessed on 2017 Feb 15]. Kannan S, Gowri S. Clinical trials in allied medical fields: A cross-sectional analysis of World Health Organization international clinical trial registry platform. J Ayurveda Integr Med 2016;7:48-52. Sridharan K, Sivaramakrishnan G. Clinical trials in ayurveda: Analysis of clinical trial registry of India. J Ayurveda Integr Med 2016;7:141-3. Sivaramakrishnan G, Sridharan K. Clinical trials in dentistry: A Cross-sectional analysis of World Health Organization-international clinical trial registry platform. J Evid Based Dent Pract 2016;16:90-5. Reveiz L, Chan AW, Krleza-Jerić K, Granados CE, Pinart M, Etxeandia I, et al. Reporting of methodologic information on trial registries for quality assessment: A study of trial records retrieved from the WHO search portal. PLoS One 2010;5:e12484. Chawan VS, Badwane SV, Gawand KV, Chhaya MU. An analysis of clinical trials registered with CTRI in India from 2007 to 2015. Int J Clin Trials 2016;3:155-8. Bhave KA, Tondare SB. Trials registered in clinical trials registry of India in 2013: A descriptive study. Int J Recent Trend Sci Technol 2016;18:409-11. Yadav P, Jaykaran, Chaudhari M, Saxena D, Kantharia ND. Clinical trials registered in clinical trial registry of India: A survey. J Pharmacol Pharmacother 2011;2:289-92. Krleža-Jeriç K, Lemmens T, Reveiz L, Cuervo LG, Bero LA. Prospective registration and results disclosure of clinical trials in the Americas: A roadmap toward transparency. Rev Panam Salud Publica 2011;30:87-96. Bhide SS, Tadavi FM, Maurya MR, Bhijne SK, Chandrakar P. Assessment of clinical trials registered at clinical trial registry of India over past decade: An audit. Int J Clin Trials 2016;3:238-43. Harriman SL, Patel J. When are clinical trials registered? An analysis of prospective versus retrospective registration. Trials 2016;17:187. 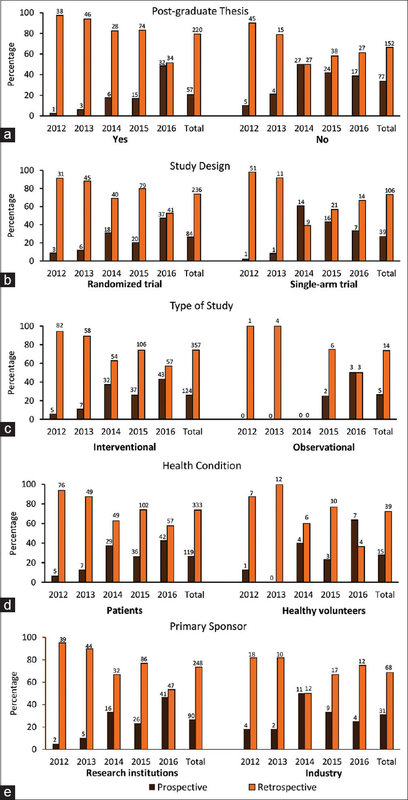 Lampert A, Hoffmann GF, Ries M. Ten years after the international committee of medical journal editors' clinical trial registration initiative, one quarter of phase 3 pediatric epilepsy clinical trials still remain unpublished: A Cross sectional analysis. PLoS One 2016;11:e0144973. Ross JS, Mulvey GK, Hines EM, Nissen SE, Krumholz HM. Trial publication after registration in clinicaltrials.gov: A cross-sectional analysis. PLoS Med 2009;6:e1000144. Ross JS, Tse T, Zarin DA, Xu H, Zhou L, Krumholz HM, et al. Publication of NIH funded trials registered in clinicaltrials.gov: Cross sectional analysis. BMJ 2012;344:d7292. Gandhi R, Jan M, Smith HN, Mahomed NN, Bhandari M. Comparison of published orthopaedic trauma trials following registration in clinicaltrials.gov. BMC Musculoskelet Disord 2011;12:278. Jones CW, Handler L, Crowell KE, Keil LG, Weaver MA, Platts-Mills TF, et al. Non-publication of large randomized clinical trials: Cross sectional analysis. BMJ 2013;347:f6104. Riveros C, Dechartres A, Perrodeau E, Haneef R, Boutron I, Ravaud P, et al. Timing and completeness of trial results posted at clinicaltrials.gov and published in journals. PLoS Med 2013;10:e1001566.